Against the wraths of time, these woods have stood. These trees together, our high walls of wood. Against the wraiths of hate, we folk must stand. Hold we together, brave with spears in hand. Cross the Bridge of Glass. When it was built, the masons put blades of glass into the mortar along its little towers to dissuade birds from nesting there. The Glassblowers’ Guild donated tiles of glass for the bridge’s walls, so it shines when the sun does. Here’s a stretch of blue tiles arranged between the cobbles; there’s a patch of yellow and green. The doors to the Old City stand open today, flanked by watchers in green and gray. One of them waves people through—they’ve been waiting for a cart of straw and asparagus to maneuver through the barbican—while the other handles a hefty wooden lockbox with a slot in the top. The toll at that gate is two copper coins. The Old City holds in the smoke from hearths and forges alike. Hear the pings and clangs of the blacksmiths? Hear the clop of hooves on stones? Nearby, a pale-skinned human fellow barks out the prices of candles to passersby—he’s hoping to make a sale. A woman with horns growing right out of her head and a red-blue tail curled tight behind her back haggles with a dwarven fishmonger whose beard is a tight braid. Someone pours cold water out of an iron pot from a third-floor window into the alley below, then flicks the last unwanted noodle out after it. 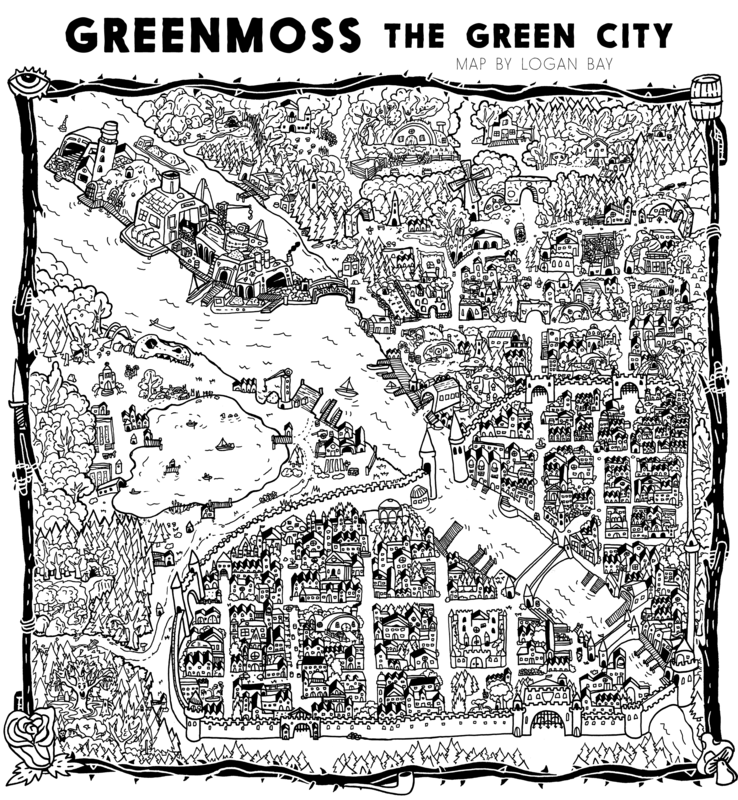 Walk along the streets of Greenmoss, from the wandering paths of the Woodland City to the narrow lanes of the Old City, and find folk going about their lives. The place teems with life. Beneath the boughs and needles of the Woodland City, squirrels dart and birds flit about, seeking out nuts and seeds from the trees. Sparrows hop toward scraps of flatbread crumbled by the elven baker outside his shop. A dog pads along the flagstones, sniffing the offered hand of a forest gnome. A bright-green skink dashes under the planks outside a confectionary shop, where candied meats hang in the window. A patrolman from the city watch steps out with a stick of spice dipped in maple syrup clenched between his teeth. The smell of burnt sugar is on the air, mingling with waft of damp moss. The forest canopy holds rain at by as long as it can but the wind shakes water from the trees and ferns. In the Woodland City, they joke that when it rains, they are the last to know. In the New Burg, people laugh and gossip as they hang their wash on lines to dry in their narrow yards. The air smells like lavender from their soap and a sting of vinegar from the fellow scrubbing the boardwalk nearby. Someone in an upstairs room somewhere sings a lullaby in Elvish to soothe a crying baby. The song is older than the city, but the singer improvises a new verse in Common—about a mouse in the house. Nearby, a dwarf in the garb of a beekeeper overhears the song and hums a bit to her bees. The honey-tenders of New Burg are descended from the apiaries of Guild Lake and sell honey to the candy-makers. Population: About 20,000 urban citizens, nearby crofters, and woods-folk. Government: Feudal oligarchy governed by four Councilors and a Lord Mayor. Defense: Local vassals serve in the Watch as rent to the city’s landed nobility, bolstering the professional guards and lamplighters in its ranks. Commerce: Common goods and services are available, often through barter, but magical goods and services are rare. Organizations: The four divisions of the city vie for resources and influence among the Councilors, while the Mytheia strive to feed the roots of the city’s culture and folklore. One tall, brightly painted house boasts decorative mushrooms carved of wood, painted red and spotted white. The wooden kegs stacked inside are burnt with symbols promising mush-mash—a kind of mushroom whisky. Across the way, a dark-skinned halfling in a stained apron cooks little morels with butter and onions. He tosses them about in his cast-iron pan. Everyone who walks by breathes in deep, and half of them become customers. Where Mushroom Lane crosses Brewers Street, a leathery human woman and her halfling apprentice have setup a wagon to sell people hearty sandwiches on soft breads. An elf buys a cob of grilled corn from them; he has a caravel tattooed on his arm. The short-haired, half-elf woman with him eats beads of fried dough from a paper cone. Click for more about Level Eater Portland.